Port Blair, Nov. 1: Four persons have been arrested from Jharkhand by a police team of PS CCS in the ATM Fraud cases. Large number of cases has been registered at PS Central Crime Station (CCS) under sections 420 IPC and 66(D) IT (Amendment) Act, 2008 regarding cheating by unknown persons impersonating as General Manager, SBI Bank and demanding confidential information from SBI account holders such as account number, debit card number, ATM pin etc. and used them to withdraw money from their accounts through unauthorised online transactions. Prima- facie it appears that the number of victims in A&N Island could be in hundreds. Based on the complaints received, a team of CCS was constituted under the supervision of SP (CID) Mrs. Aslam Khan IPS comprising of DySPs Nishant Gupta, Sandeep & Dhirendra Pratap Singh, Sub- Inspectors Usman Ali & PMK Kumar and PC/ Vikas Kumar Yadav to investigate the ATM fraud cases. Initial investigation revealed that this racket was being operated from Jharkhand and neighbouring states. Upon this lead, a team led by DySP Dhirendra P. Singh, along with SI Usman Ali and PMK Kumar was sent to Jharkhand, where they stationed for over 10 days and the accused were arrested after series of raids with the help of local police and SP Deoghar and SP Jamtara. 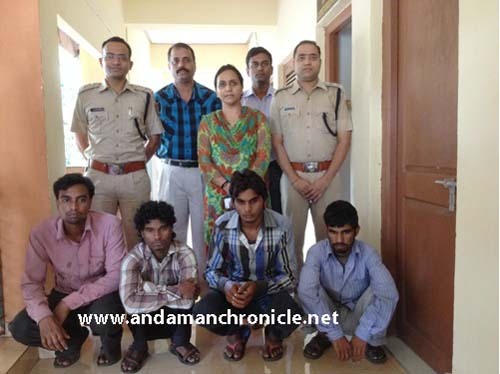 The accused namely Shyam Sunder Mandal (19 yrs), Prakash Mandal (26 yrs), Manoj Kumar Mandal (20 yrs) and Dinesh Kumar Mandal (21 yrs), were taken on transit remand and were brought to A&N Islands today morning. In total, 7 mobile phones, 9 SIM cards, 4 SBI bank passbooks and 1 ATM card were recovered from the accused. With the arrest of the above accused, the A&N Police has not only set an example to their counterparts in the country but has created a history by busting the notorious racket, known to have cheated many others in the mainland India. 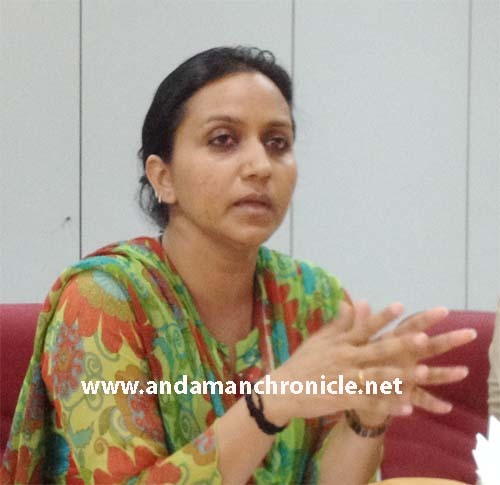 Addressing a press conference today, the SP (CID) Mrs. Aslam Khan today said that a total of five persons were arrested but since one is a juvenile, he was handed over to the concerned authorities at Jharkhand. Investigations revealed that the culprits operated in different groups with a number of SIM Cards, phones and managed to collect the customer data base from private mobile companies operating in the Islands. The calls were made at random and whosoever revealed the confidential information about their bank accounts had fallen prey. The gang used smart phones to delete the original account and the money was transferred in small amounts within minutes after the victims revealed the information. Khan further reveals that among the many victims who had fallen prey to the gang are govt. servants. As of now there are 8 FIRs registered but is predicted that the victims are many and from across the islands. Records indicate that an amount of Rs. 50-60,000/- has been withdrawn as on date but is expected to be more. This is just the tip of the iceberg, Khan explains while informing that the investigation on how the culprits could acquire the customer data base from the mobile network operators in the islands. Meanwhile investigation is also on to reveal whether there is any involvement of the concerned bank employees, she said. People are advised not to share confidential information such as their Card Number, ATM pin or any other confidential information regarding their account with anybody. In case, bank officials ask such information, they can visit the bank and clarify the same.